The University of Notre Dame has entered into a partnership with the Posse Foundation, a nationwide college access and youth leadership development program, to offer full-tuition scholarships to select students from the New Orleans area. Founded in 1989, the Posse Foundation identifies public high school students with extraordinary academic and leadership potential who may be overlooked by traditional college selection processes. Partnering institutions then offer these outstanding students the opportunity to pursue personal and academic excellence by being placed in supportive, multicultural teams — or “posses” — of 10 students at top-tier colleges. Since September and continuing through this month, enrollment staff from Notre Dame will work collaboratively with the Posse New Orleans office to identify students who are considered capable of excelling at the University. In December, these staff members, including Bishop, will travel to New Orleans to participate in a selection process in which students demonstrate leadership, teamwork and personal motivation skills. Finalists will then be selected through a three-part process, including large group and individual interviews. At a concluding celebration, 10 students will be welcomed into the Notre Dame community for fall 2016. Once on campus, Posse students will receive close mentoring by faculty and administrators. Each mentor will meet weekly with the Posse as a team and with each student individually every two weeks during their first two years of college. Additionally, Posse staff will travel from New Orleans to Notre Dame three times each year to meet with students, University staff and on-campus mentors. 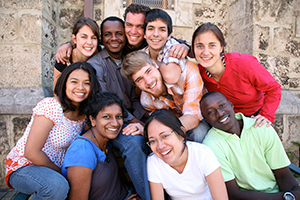 As the United States becomes an increasingly multicultural society, Posse believes that the leaders of this new century should reflect the country’s rich demographic mix, and that the key to a promising future for our nation rests on the ability of strong leaders from diverse backgrounds to develop consensus solutions to complex social problems. Notre Dame joins 55 other nationally prominent colleges and universities that have partnered with the Posse Foundation. Additionally, Notre Dame is one of 62 institutions nationally that meets the full-demonstrated financial need of all enrolled students. Originally published by Dennis Brown at news.nd.edu on November 11, 2015.